Sometimes a park can be more than a play space, it can also be a source of pride. 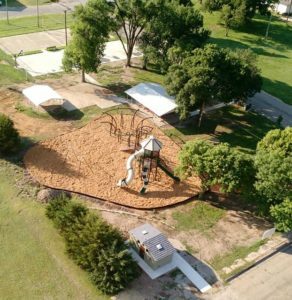 To the City of Natoma it is not an exaggeration to say that many people’s blood, sweat, and tears went into the renovation of the park including new rest rooms and playground equipment. On June 18th, installation day, the park was packed with volunteers, but not just from Natoma. Volunteers arrived from Paradise, Russell, Hays, Plainville, and Osborne. The dedication to this project was an overwhelming success to the entire City of Natoma and stretched into the surrounding counties. A grant from the Hansen Foundation contributed to the project.